Below are details of the work Bushmans Tanks have completed in the water treatment field. Water which is stored pre and post filtration. The customer is a Power Station operation which uses gas to generate electricity which is distributed throughout central and Southern Queensland. 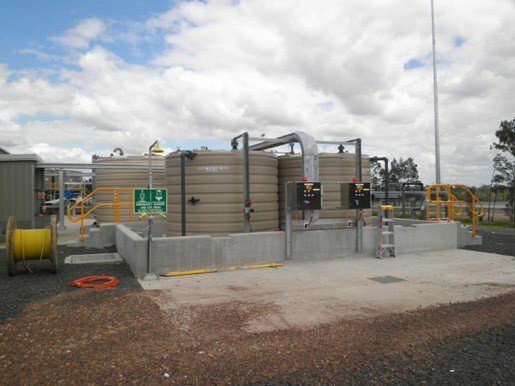 The tanks are incorporated into a water management facility which is primarily a water filtration operation. In this water processing system there are six tanks with two 10,000, 15,000 and a 46,600 litre sizes. Each tank has a range of fittings up to 250mm in size. The ability to have a range of tank sizes and to be able to incorporate fittings of up to 250mm in size, provided a simple yet robust solution to ensure the facility was easy to build and was robust in operation. The fittings were designed to suite the individual parts of the process and these ensured the combination of tank and fittings were strong and reliable.